The Self Determination or Self-Directed Supports (SDS) program for adults with developmental disabilities is how Dane County provides services for consumers who have an individual budget and a Support Broker. Building on the Dane County Difference is a collaboration between the Developmental Disabilities Coalition, Waisman Center, Dane County Human Service Department, Support Broker Coalition, Supported Living Coalition, Living Our Visions, InControl Wisconsin, Waisman Center, and Supported Employment Provider Coalition. This paper describes Dane County’s unique and highly effective approach for providing long term support to its citizens, particularly those with developmental disabilities, and includes descriptions of innovative features and positive outcomes. People First is an international advocacy organization. The Dane County chapter was formed in 1994 by individuals with disabilities living in the community. People First of Dane County advocates strongly about providing supports to individuals with disabilities to live in their own community. This means advocating for the closure of Wisconsin’s institutions and against support budget reductions. People First of Dane County uses regularly scheduled meetings to bring in guest speakers that will allow them to learn more about the important issues of the day. 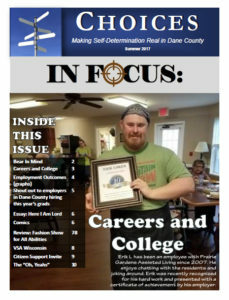 A Newsletter about Self-Determination in Dane County written with individuals with developmental disabilities for individuals with developmental disabilities, their families, and supporters. Past issues can be found on our Publications page.